VEGANS AND STRICT vegetarians will soon be able to sup a hearty pint of the black stuff, after Guinness revealed it will remove fish guts from the brewing process. 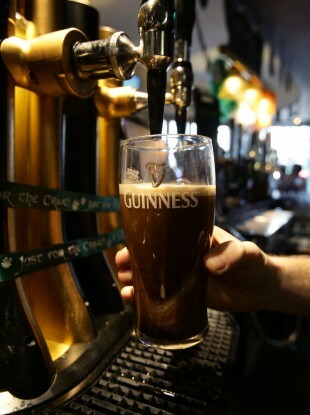 Drinks giant Diageo announced that its iconic St James’s Gate Brewery will stop using isinglass — a gelatine made from fish bladders — in its filtration methods for Guinness. “We are at the beginning of the project to install the new system,” according to a company spokeswoman. Diageo has long faced demands from vegans to remove isinglass from its production of Ireland’s unofficial national drink. “Our brewers and engineering teams at St James’s Gate are continually working to drive improvement as well as assuring the quality and craft of the brewing techniques developed here over the last 256 years,” Diageo added in a statement. “Isinglass has been used widely within the brewing industry as a means of filtration for decades. “However, because of its use we could not label Guinness as suitable for vegetarians and have been looking for an alternative solution for some time. Email “Guinness is going vegan by removing the fish guts (wait, the fish guts?)”. Feedback on “Guinness is going vegan by removing the fish guts (wait, the fish guts? )”.